•Fundraising: Nonprofit bylaws can list fundraising as a board duty, but its execution is often left to the CEO and/or a development director. In a recent survey, 65% of nonprofit CEOs gave their boards academic grades of “C,” “D’ or “F’ for their fundraising efforts. * Depending on its status in the bylaws, fundraising can be an overt duty or a latent one. No matter which form it takes, in my opinion, fundraising has to be a partnership between the board and the CEO. I suggest nonprofit boards periodically need to review duties specified by the bylaws as well as current law to make certain they are in compliance. Gaps can arise because the bylaw duties are ignored or delegated. In addition, boards need to be alert to latent duties, not readily overt, such as generating appropriate staff relationships. 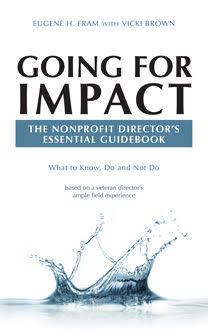 * “Leading With Intent–A national index of nonprofit board practices” (2015) BoardSource, Washington D.C.
← Radio Program Tomorrow–March 11th. I would like to add the non-profit “Boards” main duties, are oversight, holding accountable, and the hiring and firing of all officers of the company. The Wounded Warrior Project Board failed to have the checks and balances in place to hold the officers of the company accountable before this great non-profit went off the tracks.